The negative sign reverses the direction of the vector. 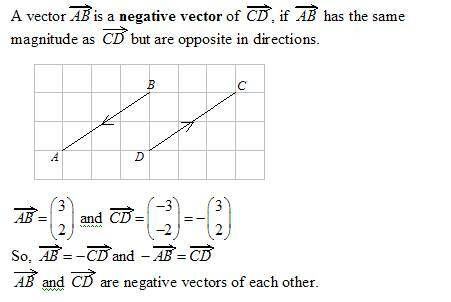 Defines negative vector and shows why vector ba is equal to vector -ab. Defines position vector and states that a vector which starts at the origin can be expressed in terms of its end point only, i.e.as a single letter vector. Consider the journey from a to b followed by the return journey from b back to a. 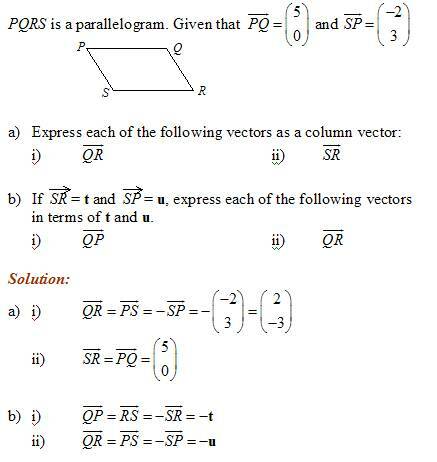 In terms of vectors, this is written as ab + ba. Overall, we have arrived back where we started; we have effectively gone nowhere. We call this vector O and trest it like the number 0. If O is the origin, then it is common practice to write the vector OA as the vector a. Any single letter vector x stands for and may be drawn as the vector OX. A vector which starts at the origin is called a position vector.